Interesting place for a “breather” episode, following on the heels of a week off for the Thanksgiving holiday and just three episodes before the end of the season, but it nonetheless was a welcome interlude. Anytime Michael’s little brother Nate drops by, hijinks ensue. Looking at recent events though, it does make sense to give Michael (Jeffrey Donovan) a bit of a breather from the umbrella story to make sure his gunshot wound is healed up properly. Also, the NOC list the gang has been chasing was being prepared for auction, so this was a reasonable place to slow down the pace. But not stop it: Sam (Bruce Campbell) and Jesse (Coby Bell) resolved to steal the list before it could be auctioned after it was stolen from wreckage of John Barrett’s SUV. 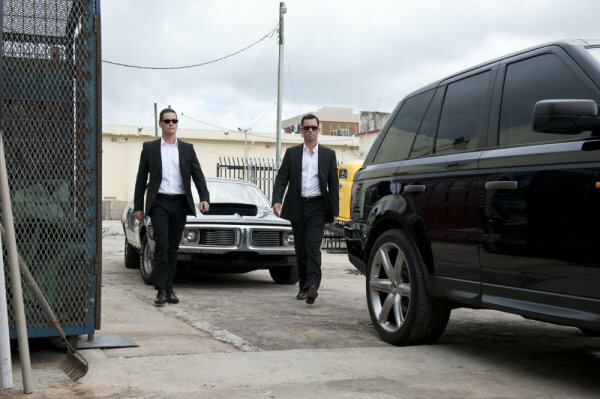 This week’s BURN NOTICE was structured so that Sam and Jesse had to stake out the area of the auction to assess security, freeing Michael for the case of the week. And that’s where Nate (Seth Peterson) came in – literally: Nate flew to Miami to ask Michael’s help on behalf of a buddy. Seems some cars were stolen from the friend’s business. And because the buddy had unwisely borrowed money from local car enthusiast/drug smuggler Hector Rivera, one of the hot cars was stuffed with a shipment of drugs. Recovering a few stolen cars should have been child’s play for Mikey, but the drugs complicated matters. And Maddie (Sharon Gless) was worried about Michael dragging his brother into a dangerous situation. (Um, Mom, this was all Nate’s fault…) “I’m holding you responsible for keeping him out of trouble,” Maddie warned Michael before the mission started. Then, in a cute bit, she took a picture of her boys all dressed up like slick mobsters. Turned out that Nate’s wife is pregnant, so he needed a cash infusion, and Maddie fretted that Nate’s need for a paycheck put his life on the line when his family needed him more than ever. Later, as the dangers mounted, Maddie threatened to put a cigarette out in Michael’s eye if Nate got hurt! Ah, there’s nothing like a mother’s love… And there’s nothing like the functionally dysfunctional Westen clan. Nate has come a long way since his nerdy roots. (Can you believe this was his 10th appearance?) Little bro has become an able partner — and even contributed a couple of big saves this week, proving that he deserves to be on the team. (If it wasn’t for that pesky wife and impending child of his…) Gless hasn’t been given a chance to do much this season, but hey, this is Michael’s story. Also, a little Maddie goes a long way, because Gless always makes the most of her scenes. Loved her cigarette threat! Did we know that Nate actually can hotwire a car better than Michael can? He demonstrated all the skills of a “seasoned pro” care thief. I must have forgotten that skill from his resume. After the car situation was sorted via the clever conceit of breaking down the vehicle and rebuilding it inside the fortified compound of Hector’s lieutenant Caleb in order to frame him, the gang turned their attention to heisting the NOC list. They devised an elaborate scheme that called for clockwork timing and precision teamwork. Their coordinated attack managed to steal the list from a fleet of motorcycle couriers. Michael finally had his holy grail in hand. This entry was posted in TV and tagged Bruce Campbell, Burn Notice, Coby Bell, Fiona Glenanne, Jeffrey Donovan, Michael Westen, Nate Westen, NOC list. Bookmark the permalink.